Sometimes it’s a mystery how one is accepted into the art world. There are rules, attitudes, passwords, dress codes, reading lists, guest lists and diplomacies that rival the complexities of whichever celebrity cult/religion is most in favour right now – but once inside, you may find yourself alone in an empty, white cube. Nonetheless, many people wish to claim and contribute to the reigning discourse and fashions of the day, be it the latest Michael Fried theory or the revival of homemade egg tempera. When we speak of the art world, we reference a regime that is both shape-shifting and institutional. Do so-called alternative spaces divert art world power-brokering? This was one question posed by ‘Artists Run Chicago’, a ten-year retrospective of 36 artist-run spaces in the city. It has long been celebrated that Chicago, more than many other major cities, thrives on a do-it-yourself energy. Alternative spaces flourish and artists open their studios and homes to exhibitions almost as a rite of passage. A few sell art, while many others exist as project spaces (an idea co-opted by commercial galleries connoting, perhaps deceptively, that the art is more important than the sale). This exhibition’s title was a bold declaration. It’s not ‘Critics Run the Art World’, or ‘The Secondary Market Is Very Profitable’; ‘Artists Run Chicago’ proposes the idea that artists can control the reception of art. Alternative spaces often exist fleetingly; here tonight, gentrified tomorrow, their histories shared orally. Fittingly, the layout of ‘Artists Run Chicago’ forsook a chronological approach in favour of an open plan arrangement in a very large space; it looked as if the booths had miraculously evaporated from a convention centre-style art fair. 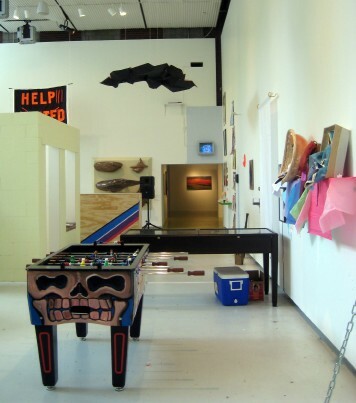 About 150 objects by 90 artists formed a playground of art, including sentimental memorabilia from defunct venues (old guest books, a cut-up credit card), newly commissioned site-specific projects, and at least three manifestos produced for the occasion. A historic gallows used to punish some of Chicago’s most notorious criminals also made an appearance, of sorts. In 2006 the city’s history museum lost a bid to own it. The NFA Space facilitated the loan of the gallows as their contribution to the exhibition, but for this show the instrument of execution was hidden inside its massive black shipping crate – a caution against corrupting an ‘authentic’ experience by subjecting it to commercial spectacle. Who, it seemed to ask, writes the history of the departed? Alternative and artist-run spaces aren’t exactly dispossessed or subaltern, although they do pine for their share of cultural relevance. In fact, many intentionally borrow the institutional language of art to clarify their often murky or quirky aims. Julius Cæsar gallery commissioned a museum-style audio guide and refashioned the headphones as wearable sculpture. Philip von Zweck displayed leftover materials from a Yutaka Sone installation in a vitrine-like case, as well as a beverage cooler ‘on permanent loan’ from another gallery. Build ‘a funky white cube with the earnest intentions of mounting an exhibition that will change your little corner of the world’, suggests Deluxe Projects in their 12-step programme on how to open a DIY art space. The white cube – still the accepted ideal background for contemporary art – seems awkwardly adaptable to an apartment gallery, but the model persists. Although successful in their own ways, the three above-mentioned practices still covet the spaces they exist as an alternative to. No matter if the method is ironic subversion or respectful emulation, the goals of inclusiveness and community-building are animated by institutional role-play. Art spaces are often accepted by the communities they co-exist within, which, although not a bad thing, is still a low-risk venture. A white painted canvas by David Coyle, White monochrome painting (2009), exhibited by The Suburban, is the sort of party prop that has come to define the mainstream alternative. Truly alternative, however, is the Artist Run Credit League, which was initiated by InCUBATE and Alogon Gallery: participants contribute money to a credit fund, and the payout goes to a member in need. It’s this type of community-building effort, risky but innovative, that creates meaningful experiences.